We’ll see in this twitter bootstrap tutorial, how to create a simple yet elegant gradient responsive navigation menu with bootstrap css. Bootstrap has a built in navbar component and creating the navigation bar with it is relatively simple, provided you follow the right steps. By responsive we mean that the navigation bar adjusts itself to the available view port size. Say it will be extended to the full width when viewed in bigger screen like desktop/laptops and collapse itself to fit to the smaller screens of mobiles/tablets. Just take a look at the below image, which depicts clearly of how our navigation bar at the top looks on different devices. First we’ll plan the design of our navigation bar. Once we’ve planned, it will be easier to put it into action. For the demo, I’ve planned to create a navbar at the top of the page, with the brand-name/logo at the left side and the menus at the right side of the bar. Come! let’s walk through the steps one-by-one to make our goal. The first and foremost step to make our page responsive is to tell the page to span to the full width of the viewport available. So we'll add the below tag within the section of the html page. Let's write the actual html markup for the navbar. Since I’m using HTML5, I’ll add <nav> element to create navigation bar. But it will work if you use the below given markup with <div> element. Our Navbar will now look like this. We have used the css class “navbar-default” with <nav> element to create the above default navbar. The navbar is supposed to be made of two sections. One is the navigation header which contains the site logo or name and the other contains the menu itself. In the menu section we’ve used "navbar-collapse" class to shrink the menus and make it stack one after another for mobile devices. Since we want the menu at the right side of the navbar, we’ve added the class "navbar-right". If you don't want the menu to be pulled up to the right side, you can neglect the class "navbar-right". Also note that it’s a must to include role="navigation" to make your navbar accessible. The default navbar is ok, but I want more spice to this. So I'm going to customize this plain design with some appealing colors and gradient. If our requirement is minimal, there is a quick and dirty method to customize the bootstrap classes. We can override the native bootstrap classes in a separate stylesheet and link them next to the bootstrap stylesheet in our html page. So I'm going to create a stylesheet named "custom.css" and write some css styles to make the navbar look better. After customizing, now this is how our final navigation bar looks. A few tweaks to the native bootstrap classes and here we have turned the plain navbar into an eye candy. If you want this navbar to fixed to the top of the page, while you scroll down the page, all you have to do is to add one more class "navbar-fixed-top" to the <nav> element. Is it possible to fix the navbar to the bottom of the page? Yes, you can. 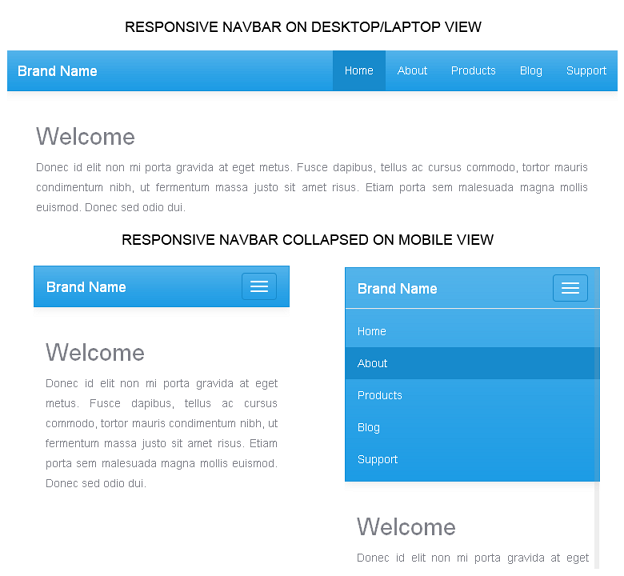 Just add the class "navbar-fixed-bottom" to the <nav> element. We have seen how simple it is to create a custom responsive navigation menu with bootstrap css without sticking our head in complex logics. It is just a taste of a bit what we can achieve with twitter bootstrap. Hope you would have enjoyed this bootstrap tutorial. Let us meet in another one interesting tutorial.